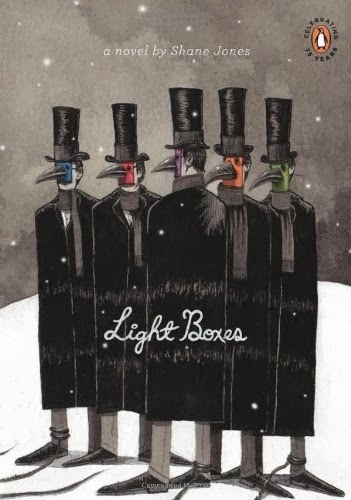 Light Boxes by Shane Jones is a novel of experimental writing told from multiple perspectives. I think it has a fantastic cover and the blurb on the back of the book convinced me I would like this book. The inhabitants of a closely knit town are experiencing perpetual February, and that means unending cold and darkness. It turns out that a godlike spirit, named February, is punishing the town for flying and bans flight of all kind, including hot air balloons and even children's kites. It's February who makes the sun nothing but a faint memory, who blankets the ground with snow, who freezes the rivers and the lakes. As the punishing weather continues, children go missing and adults become nearly catatonic with depression, all but giving up hope. But others find the strength to fight back - and launch a war against February. I did not like this book. I wanted to like this book, but after reading more than half of it I had zero interest and decided to consider it DNF (did not finish). I love fables, even dark fables. I love metaphor. I love the surreal. I love imagery. I love fantastical, magical tales. I guess you could say this book has all of these elements, and yet .... The elements didn't pull together for me. I understand that the writing is experimental, and I don't mind experimental writing. Experimental writing requires the reader to look at it differently. Yes, this can be more work for the reader, and I don't mind working for it. I do expect some kind of "pay off" though. I should enjoy it, I should be intrigued, or I should be thinking "deep thoughts" because of it, or it should move me in some way, or .... Let's just say I did not enjoy it, did not remain intrigued, did not think deep thoughts, and I wasn't moved. Instead I was annoyed. Frustrated. I had a big question mark hanging over my head. I wondered why I was spending time reading it. This book did not connect with me, and I do believe that a reader should be able to connect with a book on some level for some reason. I'm familiar with reading poetry as prose, and it is my understanding that Shane Jones writes poetry. One of my favorite authors, Ray Bradbury, does this (read The Halloween Tree) and I love it. There is a flow to the words and images. I can hardly separate the words from the images in my head and the feelings pressing against me and reaching for my emotions. I tried to read Light Boxes in this way. Nope. Didn't work for me. The writing in Light Boxes seemed too conscious of itself, as if on every page it was shouting, "Look at me! I'm experimental!" It came across as gimmicky. It lacked the poetry. It was more like looking at a writer's notes about a story, still in draft mode. With all that said, I still love the cover (illustration by Ken Garduno) and there are plenty of readers who did like this book - very much. You can read their reviews on Goodreads, LibraryThing, Amazon.com, etc. and then decide for yourself whether or not you want to read it. Did you read Light Boxes? Did you write a review? If so, let me know and I will link to your review in order to provide other perspectives. Maisie Dobbs is categorized as a mystery, but I would consider it general fiction or historical fiction. The main character, Maisie, is a detective and there is a mystery to solve, but the novel diverges from the usual patterns of the mystery genre. 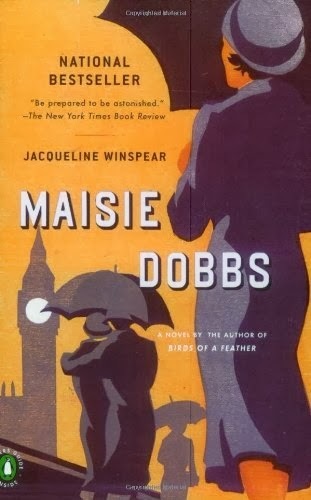 Maisie Dobbs is primarily a character driven novel and the plot takes a backseat to the main character. The novel is divided into three sections. The first section introduces Maisie in 1929 as she takes on her first investigation case with a mystery to solve. This section reads very much like a mystery novel. The second section is a flashback to Maisie's youth, prior to WWI, as a smart young girl taken into service as a scullery maid in the home of Lady Rowan. It is here, as part of Lady Rowan's progressive social beliefs, that Maisie is provided an education alongside her service as a maid. Maisie is also mentored by a rather enigmatic gentleman detective and government consultant as part of her education. It is hoped, by this gentleman, that Maisie might one day take over his business when he retires. This section also describes Maisie's war experiences as a nurse during WWI. The entire second section reads like historical fiction. The third section of the book returns to 1929, the mystery, and its resolution. The third section is somewhat suspenseful, but not overly so. I found both the character of Maisie Dobbs, as well as the historical and social aspects of the novel, quite satisfying. I fell in love with Maisie and her unconventional detecting methods. Maisie's real skill is helping people find the truths about themselves. The detecting becomes more about the people involved than about the events. There is a bit of Eastern mysticism involved in Maisie's intuitive methodology that I hope the author engages with in future books of the series. I am particularly interested in the time period covered in this novel with it's early 20th century shift from a class-based society to an emerging (more) egalitarian one and the social issues that are involved with that shift. Those who like Downton Abbey will probably enjoy this first book in the Maisie Dobbs series. Particularly heartbreaking in this novel is the trauma of WWI and the deep scar that the horror and grief left on Great Britain for many years. The novel captures this personal and national grief well through plot and character. I must mention that there were a few times I had to suspend my disbelief. I don't know if the author decided to take liberties with her writing in order to suit the storyline or if this was oversight. It will be interesting to see if this continues in future books. I highly recommend this book to those who like historical fiction, character driven novels, or just a good story. I noticed that School Library Journal reviewed the book which tells me it is a crossover novel between adult fiction and YA. I don't think it is marketed as YA, but it is certainly appropriate. Have you read this book? What did you think? Let me know if you've written a review and I will add it in a list below. Here is what others have to say! A Tree Grows in Brooklyn is the story of Francie Nolan. The book opens on a summer afternoon in 1912 in Williamsburg, Brooklyn with the sun shining through the branches of a tree called the Tree of Heaven. This tree had "pointed leaves which grew along green switches which radiated from the bough and made a tree which looked like a lot of opened green umbrellas." This tree grew lushly amidst the tenement houses and reached for the sky. Francie is 11 years old and lives in a humble apartment in a run down neighborhood with her brother and mother and father. Her father, Johnny Nolan, is quite a charmer who sings and waits tables but spends the majority of his money on alcohol. The financial support for the family falls to Katie, Francie's mother, who works as a janitor in exchange for rent. Francie loves to learn and enjoys school, but the neighborhood school is a cruel place. Out walking one day, Francie sees a beautiful school in another neighborhood. She longs to go to that school and, ever hopeful, she shares this longing with her father. Johnny is a dreamer too and he finds a way for Francie to transfer to this more gracious school where she thrives and becomes quite the writer of stories. Truth and fancy were so mixed up in her mind - as they are in the mind of every lonely child - that she didn't know which was which. But teacher made these two things clear to her …. "In the future, when something comes up, you tell exactly how it happened but write down for yourself the way you think it should have happened. Tell the truth and write the story. Francie writes lovely stories that reflect the way she wishes things to be. She is innocent. A Tree Grows in Brooklyn is a coming of age story though, and in this type of story we witness the painful loss of innocence. We see this in Francie's development as a writer. She begins to write "sordid" stories that reflect more truthfully her own life experiences. Francie's English teacher disapproves of this new writing and wants her to burn the "ugly" compositions. Francie refuses and, instead, burns all of the old flowery writings that have nothing to do with her life experiences. In this symbolic loss of innocence we see Francie become aware of her identity as a person and writer. These changes, as anyone who has survived childhood knows, are painful and we grieve our lost innocence. Francie, likewise, grieves for all she has lost in the scene with the roses. This scene was so powerful I felt the pain of my own experience all over again and it left me in tears. I guess this is your warning not to read this scene in public! Coming of age stories are meant to bring up a lot of feelings in the reader. They touch on a shared experience. They speak of longings and overwhelming feelings. A time when we learn that things CHANGE, but we don't want them to. We don't like endings because, "The last time of anything has the poignancy of death itself …. And you grieve because you hadn't held it tighter when you had it every day." These are powerful feelings that we learn to manage as adults, but in the emerging adult they create emotional chaos. A message of hope usually goes along with the pain of a coming of age story and, I suspect, this is why those of us who like such stories keep reading them. Throughout the book Francie remains sensitive and caring and hopeful. In the end, she looks to the future without denying her past. And the Tree of Heaven in her yard, that was not gently tended, keeps on growing as a symbol of perseverance and hope. I absolutely LOVED this book. The author writes beautifully and captures the intense feelings that come with "growing up." I truly cared about the characters and thought the author treated them very sympathetically even though they, like us, are quite less than perfect. 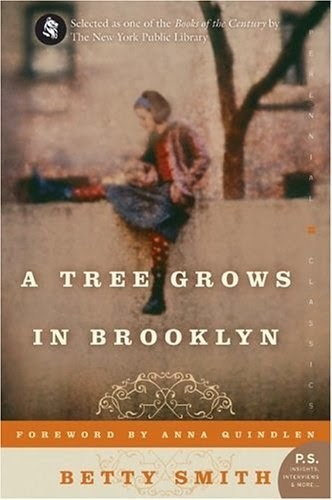 Many social themes are woven throughout A Tree Grows in Brooklyn, though the author claimed she did not mean the book to be a social commentary. This book would make a fantastic book club read with its variety of themes. Take a look at the themes listed below for conversation ideas. I wrote SO many quotes from this book into my reading journal and look forward to revisiting the book through these quotes until time to read it again. A Tree Grows in Brooklyn was written by Betty Smith and was first published in 1943. It is largely autobiographical. I recommend this book to most adults and some adolescents. Those adults who already know they do not like the emotions that go along with coming of age stories might want to skip this book. Francie asks her father about the strong and confusing feelings she is experiencing and he responds that he suspects she has a bad case of "growing up." Adolescents in the midst of "growing up" might find the book helpful as they navigate "all the feelings," but others might find it overwhelming. Anyone interested in the variety of themes listed above will most likely appreciate this book. I read A Tree Grows in Brooklyn as part of a read-a-long hosted by Lesley at Words of a Reader on YouTube (BookTube). You can link over to her channel on YouTube and search for her review video when it gets posted or, check back here for a direct link. I will edit this post and add links to the responses of other readers as they are posted and I become aware of them. Let me know if you have a review. A lovely vintage classic first published in 1943. A book about writing and life. About a werewolf with a radio show. Don't judge me. Welcome to Terri Talks Books! I'm a long time blogger at Tip of the Iceberg and have recently created companion websites here and at YouTube that focus on book and reading related topics. This is a bit of an exercise in personal social media management, branding, and marketing. Hopefully it will also benefit my readers and viewers by making it easier to find me in the various places I talk about books. Tip of the Iceberg is not going away. It will be re-purposed back to its origins as a personal essay blog. It will also house my archive of book reviews originally posted to that blog. I'm not moving old posts to Terri Talks Books, but I have created title and author book review indexes that will link you to archived reviews as well as index new reviews posted here. Links to those indexes are at Find My Book Reviews in the header menus of both blogs. I've put a link in the header menu at Tip of the Iceberg that points here to Terri Talks Books. So if you end up over there, you can easily navigate here. I'd love it if you follow me at Terri Talks Books. There are links in the sidebar to help you subscribe in various ways.